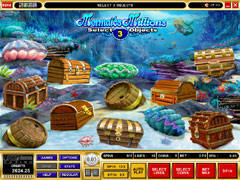 Mermaids Millions has an adventurous Treasure theme, with players able to bet up to 5 coins on each of the 15 paylines, taking the maximum wager per spin to 75 coins. Scatter wins will trigger the Free Spins feature where all wins are Tripled. The Treasure Bonus will give players a chance to share in the sunken treasure of the ocean floor scattered with treasure filled chests, barrels and clams.